find the Chick-fil-A in a crowded airport!! According to the San Jose Spotlight, city attorney Rick Doyle warned against objecting to Chick-fil-A on grounds of political or religious beliefs as these may be found in violation of the First Amendment. City organizers voted to withhold a proposed two-year contract extension from 2026 to 2028 for airport vendors that do not open every day. 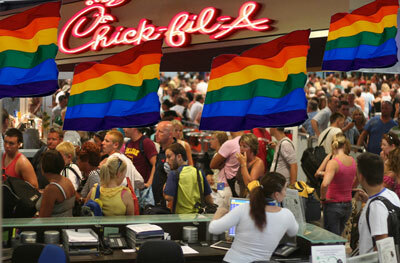 That would directly affect Chick-fil-A; the company is famously not open on Sundays. I have to admit I thought it was hilarious that Chick Fil A opened in a football stadium, in Atlanta. And no, they didn’t open on Sundays there. I’ll bet the other food servers in the airport would love to have a competitor that shuts down on Sundays. These SJWs sure put a lot of effort into their love, acceptance and inclusion! People gonna find their delicious hate chicken no matter what the Leftists do. *Somebody* oughta send a platterful of delicious Chick-A sammiches to the next Council meeting. and some nuggets — Loves them nuggets! ^ Might be a good job for the local Tea Party cell. Aren’t these the same people who lecture me daily on inclusion and tolerance? And what do you do when it’s Sunday and you really, REALLY need some Chic Fil A?